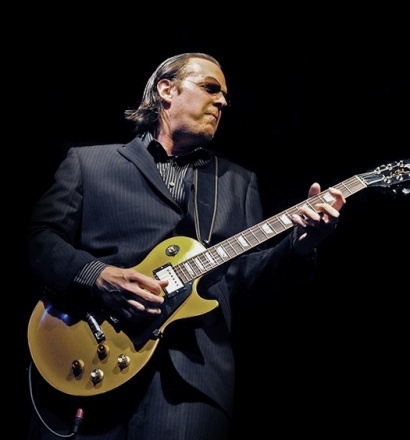 It’s a sign of Joe Bonamassa’s increasing profile that he got blues legend B.B. King to guest on his eighth album Black Rock -- and if what you’re doing is good enough to rope B.B. in, there’s not much reason to change, so Bonamassa doesn’t tinker with his formula here, retaining a little of the folky undertow of The Ballad of John Henry, but with its remaining roots in a thick, heavy blues-rock more redolent of ‘60s London than the ‘50s Delta. Of course, Bonamassa has never shied away from his love of Brit-blues, even underscoring it with a good streamlined cover of Jeff Beck’s “Spanish Boots,” but he retains a healthy respect for all manners of classic blues, kicking out a Chicago groove on a cover of Otis Rush’s “Three Times a Fool,” reaching back to Blind Boy Fuller for “Baby You Gotta Change Your Mind” and ably replicating B.B.’s latter-day soul groove on a horn-smacked cover of Willie Nelson’s “Night Life.” Bonamassa has an ear for non-blues writers too, cherrypicking Leonard Cohen’s “Bird on a Wire” and John Hiatt’s “I Know a Place,” tying it all together with beefy lead lines, but the provocative moments on Black Rock are all self-penned, whether it’s the clattering stomp “When the Fire Hits the Sea,” the British folk lilt of “Quarryman’s Lament” and “Athens to Athens,” or the droning dramatic epic “Blue and Evil.” These are easily the most intriguing songs here, suggesting Bonamassa realizes that the familiar covers allow him to stretch out elsewhere, and while it might be interesting hearing him follow this path for a full album, what’s here on Black Rock is both satisfying and admirably, if reservedly, ambitious. Just awarded the Breakthrough Artist of the Year Award at the U.K.’s prestigious Classic Rock Roll of Honour Awards, blues-rock guitar hero and singer-songwriter Joe Bonamassa is set to release his tenth full-length solo album, BLACK ROCK, on March 23, 2010. This album was recorded at, and named for, Black Rock Studios in Santorini, Greece. With this album, we wanted to explore a ‘world’ feeling, and this was the inspiration behind going to record in Greece and using some of the best Greek musicians to add a little flavor to a couple of the tracks. But it’s by no means a ‘world’ album. We wanted Joe’s usual youthful and energetic tones to play alongside the worldly vibes of the Greek bouzouki and clarino, said producer Kevin Shirley. Bonamassa says, It was the kind of record Kevin and I wanted to make. We needed to rock again a bit like on my first album. I wrote the whole thing there. Also Joe signed up Blues legend B.B. King for a duet on his new album. The song they perform together is a rendition of the Willie Nelson-penned song, Night Life, which appeared on King’s 1967 album BLUES IS KING. Shirley says about the experience, This is a rollicking Stonesy-vibe version of the Willie Nelson song on which B.B. King duets with Joe, both vocally and on his famous Lucille guitar. What a joy and an honor to work with the legend who is possibly the pivot point and unifying musician between Blues and Rock. Other tracks appearing on BLACK ROCK include Jeff Beck’s Spanish Boots, Leonard Cohen’s poetic Bird On A Wire, Otis Rush’s Three Times A Fool, Bobby Parker’s Steal Your Heart Away, Blind Boy Fuller’s Baby, You Gotta Change Your Mind, John Hiatt’s I Know A Place, and James Clark’s Look Over Yonders Wall, as well as the originals When The Fire Hits The Sea, Quarryman's Lament, Wandering Earth, Athens To Athens, and Blue and Evil. Voted by Guitar Player readers as 2007’s Best Blues Guitarist, blues-rock guitar virtuoso, vocalist and songwriter Joe Bonamassa released his seventh solo album, Sloe Gin, on August 20 2007. Bonamassa’s third for Provogue Records in Europe (excluding the 4 backcatalogue releases and 1 DVD), the disc re-teams him with producer Kevin Shirley (Joe Satriani, Black Crowes, Aerosmith, Led Zeppelin), who produced 2006’s You & Me, which debuted at #1 on the US Billboard’s Blues chart in June of last year, and was voted the “Best Blues Album of ‘06” in Classic Rock, UK and reached #54 in the Dutch Album Charts. "Sloe Gin is different than anything I’ve ever done before. I know we bettered You & Me,” said Joe during a quick break in the non-stop touring that continues– in Europe and the U.S. – throughout ’07. “The songs are more refined, and I was concentrating on them as a whole rather than only thinking about a 50-bar guitar solo. Also, singing is a bigger part of it for me than ever before, and it’s awesome to have that space – to connect with fans on a musical and lyrical level. ”Bonamassa attributes much of the disc’s power to his continued collaboration with Kevin Shirley – “It’s unbelievable, he takes my vision, augments it, and brings it further than I ever would have thought to.” Joe specifically cites his influence on the title track “Sloe Gin,” a slamming, raw blues-rock opus clocking in at over eight minutes. “I never would have found that one on my own,” says Joe, “or gone where Kevin went with it. I really owe that whole sound for me to him. "Shirley unearthed the rare song, written by Bob Ezrin and Michael Kamen, from Tim Curry’s little-known 1978 solo debut LP, but Bonamassa inhabits its rough edges and melancholy force – vocally and instrumentally – as if it was written just for him. Joe’s live performances of “Sloe Gin” at shows are currently drawing major fan chatter and Internet buzz. “A few bars into it,” he says, “people are singing along. It’s going to be the biggest song we’ve ever had. Renowned for his fluid phrasing and post-modern fusion of traditional roots blues with rock and roll guts, Bonamassa began playing guitar at age four, and toured with blues icon B.B. King when he was twelve. Recently, Joe was named Best Blues Guitarist in Guitar Player Magazine’s 2007 Readers’ Choice Awards. He’s also the youngest member of the Memphis, TN-based Blues Foundation’s Board of Directors, and is spokesperson for their respected Blues In The Schools program.